Just a girl with a hammer: Housepainting. Oh my god. After almost a year of obsessively walking our neighborhood and discussing the merits of other people's paintjobs (that's what the song OPP was about, right?) we booked a house painter. We've been playing with the Sherwin Williams color visualizer, which is a pretty nifty tool. Our painter dropped off a book of color combinations and we plugged in a couple of our favorites, only to find that they looked terrible once we pulled them up on the visualizer. Accidental finding: it's really helpful to have your neighbor's house in your photo so you can see how your house will look next to theirs (the house on the right side of us is white). 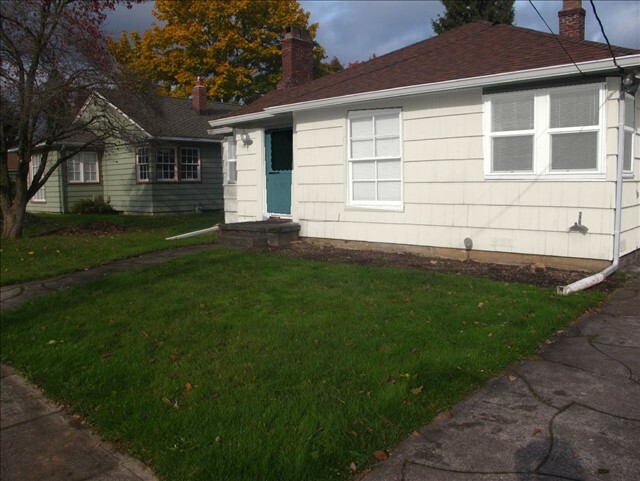 I'd love to paint the house a warm white and let the landscaping provide the color, but Greg won't go for it. He says it will get too dirty. This from a man who hates that I ask him to remove his shoes inside the house. We are both leaning toward blue at this point but blues are *so* tricky. Complicating things is the fact that our house doesn't have much trim, so we don't have a whole lot to diffuse or play off of a bold color. Our windows don't have a paintable inset, so we can't use two colors on them. And our roof is kind of orange. I love the orange but gray would be way easier to work with. In fact, the more I look at this picture of my house the more I realize that my house just isn't that great to look at from the outside, bad paint job aside. I never really realized this because I'm in love with my house. I imagine this is what it feels like when a parent realizes that their child is not beautiful to other people. We are tentatively booked for late February. As in this month, holy sh*t. The painter will paint three different swatches on our house for free, after that we have to pay extra. He said one client had him put up 16 different swatches . . . and then never paid him. As long as it's not raining, they can paint during the winter using a special paint. He claims it's more durable so it's a good deal for us. I assumed they only work in the summer so this is a nice surprise. Our friend Maura warned us that we would hate the first swatches we put up, no matter how much we liked them in the visualizer. This makes sense; it always happens with interior paint colors. So we're kind of resigned to paying more for more swatches. Part of me wants to ask the painter to "surprise us" with his favorite exterior color, like you'd do with a server in a restaurant, but I know our painter won't go for it. Hot pink tree in April - May. Lighter colors supposedly make your house look bigger but I'm confident in the size of my house. This isn't California, I don't need to compensate. Future landscaping which will not include a lawn but will include a rain garden with tall grasses. I want another cryptomeria, which has a deep russet color in winter. HGTV claims that reds, greens, and blues fade out faster than neutrals, leaving your house looking washed out. We already have two pink houses on our street, so don't anybody go suggesting it. Has anybody painted their house? Any mistakes you made or words of wisdom? Go ahead, get opinionated. 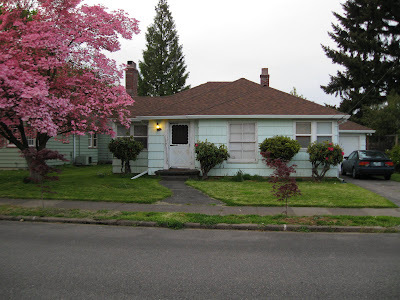 though I still haven't updated our blog header, we got our house painted in the spring of last year. It's really really really light gray (in photos it looks white, but in person you can see the light gray haze). I LOVE it. We went with blue trim (funny we both like the whites and blues). I really like the neutral-ish palette because when we (eventually...) landscape all the plant colors will really pop off of it. Your new paint job looks awesome. No matter what color we go with, I'm excited to have the outside look cohesive. I'm also excited that we're not DIYing this one. It's so decadent to hire out! Why are dudes so weird about paint colors? I think your house would look GREAT painted yellow. How exciting! My main word of advice...avoid white. Your plants will pop so much better against color. We went from (dirty, peeling) white to chocolate brown last spring...I love it. 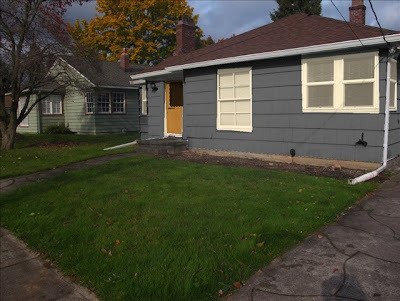 Our neighbors who have basically the same house (and they both look a lot like yours) went with a blueish grey which is also good. I'm excited to see the swatches (you'll share those right? )...and yes, you are so smart to hire this one out! Oh and could you shoot me an email? I'm wanting to put together a plant exchange and send you an invite...but I realized I don't have your email. I assume you've got mine since your comment form asks for it but just in case spikyplants (at) gmail (dot) com. Ah, this is good to know. Do you remember the name of your paint color? I might be able to sway Greg into considering something other than blue if I can show him how wonderfully your plants pop off of that color. Please don't go with gray! There is so much gray in our sky here in the PNW that it is depressing (to me) to see houses blending into the blah. Yes, my house is gray... sadly gray, but it's vinyl siding and I can't change it. I do, however, have perky blue and white trim and will paint the foundation a dark dark green. More color is better!!! ps: Love you new header! Thank you! I am not graphically inclined, so I know that old one was really bad. This is such a good point. Loree really has me thinking that we can go with deeper darker colors because we'll have so much greenery in the front yard. I love the Marigold door. Something about that color just makes me smile. I love the mustard colored door. One thing I have noticed about white houses is that a lot of the time they look run down unless repeatedly painted year after year. Ah, this is true! I think that door is going to be a keeper. I wouldn't beat you with a bird bath. They are WAY too heavy to pick up! Sage Green is my fave of the ones you posted. And I think it would go well with the pink tree and stuff! We bought a brick house, so lucky for us we don't have exterior paint to worry about, except for on the shutters (which are DESPERATELY in need of repainting - they were dark brown at some point in time, but are now a *lovely* rusty reddish not-a-real-color). I grew up in a green house (which is in a forest, surrounded on all sides by trees - nice camouflage) so maybe that has influenced my taste? Since your neighbor is green, I'd go with the downing earth and the marigold door. That combination will go well with your autumn-colored plant palette. We went with Eagle Rock, it's a brown gray and I LOVE it. Ooh, I'm going to pull that one up--thank you! Roycroft Pewter/offbeat door OR Pewter green/bengal grass !!! I love the marigold yellow in theory, but just by itself (ie no trim) I think it could end up looking a little out of place. It's nice for a bold pop of color, but if you're planning to go crazy with plants, I think they could provide tons of color for you! Not to totally through you off, but have you considered a deep red, almost like a brick red? In a color book I have, I can't deny how beautiful the deep/brick reds look against the green landscaping/bushes in the picture. Enough so that'd I'd consider doing this myself, except I'm in a city block and every other house on the block is brick, so I'd like to make ours different. I also like red & pink together, so I don't think the tree would throw it off. Just something to consider! We had our house painted a few months ago. http://diynot.tumblr.com/post/10494979349/the-house-is-painted We chose a fairly bold color, and while I was a little nervous about it at first, within a couple days I was certain that I loved it and still do. A couple of tips: I agree with the comment about gray in the Pacific Northwest - blahsville. We are in Seattle and some neighborhoods have really gorgeous colors, while others have such a muted color palette it is just sad in the winter. Those colors are pretty safe, but hard to get excited about. I think my house looks great every time I come home and it really makes me feel good. The other tip is that even with the swatches painted on, it's still hard to get a sense of what it will look like when the whole house is that color - it just looks different when it's covering a larger area. If I had it to do over again, I would drive around on a weekend and choose a house (not too close to yours) that is a color you love, then ask them what is the paint color. Or ask your painter if he/she can match it. Good luck! I like the first one. Normally I love green houses but your neighbors is green so I vote blue.